If you have been considering purchasing a new salt water pool or if you want to convert your existing chlorine system with a salt system, then you should consider a few common misconceptions. With the sudden popularity of these pools there are a lot of myths that have been propagated by owners and sellers alike. No more worrying about pH levels. Keeping salt pools clear of germs and algae requires a balance of germ killing chemicals. Chlorine is the primary disinfectant used in a pool. Many homeowners though find that they are needing to add more chlorine to effectively kill germs. This can be attributed to high pH levels. 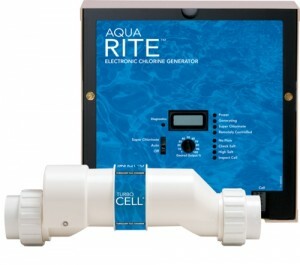 A balanced pH and alkaline level is essential to maintaining optimum chlorination. Not only that but pH levels will also affect the comfort of swimmers. Levels about 7.8 could lead to eye and skin irritation. Most pool owners convert to salt water pools because they are told they are maintenance free. This is not true. Balanced water is essential and this requires frequent testing. You can taste both the salt and the chlorine. A properly maintained salt water pool has a salinity level around 10 per cent of water from the ocean. Most salt water pool owners can attest to the fact that the water in a salt water pool is very similar to that of water that has been softened. Soft water has a better feel and is less harsh on skin and clothing. Salt water pools with the proper level of salt will not have a noticeable difference in taste. Salt water pools don’t require maintenance. New owners of salt water pools quickly discover that these systems do require maintenance. While you do not have to continually add chlorine as with standard pools you do need to maintain the chlorine generation cells. Most salt water pools use titanium plates that are electronically charged to turn salt water into chlorine. Calcium builds up in the ‘cells’ and must be cleaned. Failure to do so will result in reduced chlorine generation and your pool will no longer be able to fight off germs and algae. 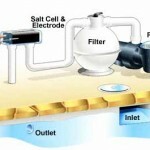 Maintaining proper salt levels will also shorten the life of the chlorine generation cells. So there are times when either water or additional salt will need to be added to the pool. Salt water pools are cheaper than regular pools. There is a lot of confusion on this point. So let’s clear things up. The cost savings on one of these pools is based primarily on how long you own the pool and how well it is maintained. This is because salt pools are initially more expensive to install. Over a short period of time a standard chlorine system is cheaper. However continued operation costs over the next couple of years will begin to surpass that of a salt water pool. Chlorinated pools are constantly losing chlorine. Sunlight, splash outs and inclement weather are usually reducing the amount of chlorine requiring the use of chlorine pucks and pool shock systems. These can be expensive and dangerous to handle. There are other costs associated with salt water pools. Replacing pave stones, pump parts and chlorine generators can be expensive. In the end salt water pools aren’t very cheap at all.